KENWOOD BOXED KDC-C660 COMPACT DISC AUTO CHANGER. Condition is Used. KENWOOD KDC-C467 Car 6 disc Cd Changer. The unit has usual scuffs from being in a boot or under a seat most of its life but nothing serious. Ve ry rare to p en d model ofc ha ng er. 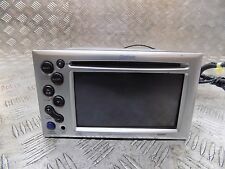 KENWOOD KDC - C469 BOOT CD MULTI CHANGER 6 DISC With Cartridge . KENWOOD KDC - C469 BOOT CD MULTI CHANGER 6 DISC With Cartridge .. Condition is Used.Removed from E39 2002 525D SE. 4.5 out of 5 stars - KENWOOD KDC - C469 BOOT CD MULTI CHANGER 6 DISC With Cartridge . 5 product ratings5 product ratings - KENWOOD KDC - C469 BOOT CD MULTI CHANGER 6 DISC With Cartridge . The KDC-W7534U also features Kenwoods System E advanced crossover system. The CD section features scan, random, and repeat functions, as well as a Wolfson 24-bit DAC for unparalleled CD reproduction. Kenwood 10 disc CD Changer for sale. I have no idea if this works as it has been in our garage for years. HERE WE HAVE FOR SALE A KENWOOD CD RECEIVER WITH CRADLE & CD COMPACT DISC AUTO CHANGER. LOOK BARGAIN YOU SHOULDN'T MISS !! KENWOOD 6 OR 10 DISC GENUINE CD CHANGER LEAD 15-16 FT LONG OLD RECTANGULAR ONE . Condition is Used. Dispatched with Royal Mail 1st Class. THIS CD PLAYER IS GENUINE HAS BEEN IMPORTED FROM JAPAN AND ITS IN JAPANESE LANGUAGE. Item is in used condition may have usage marks and scratches. What you see is what you will get ! Kenwood 10 Disc Cd Changer Magazine, never used.Dispatched with Royal Mail 2nd class signed for. Sold In Working Condition. Used Stereo And Matching Amplifier Removed From A Porsche 944 S2. Kenwood cd auto changer box cable. good thick cable. has a bit tape on 1 plug. Fully working Kenwood 6 disc cd changer cartridge. Kenwood KDC. ALL BELOW SPECS FROM KENWOOD WEBSITE. CD changer. external CD changer. THE CHANGER UNIT WAS WELL LOOKED AFTER. Sound Output Mode. Car Audio Type. Audio System. This radio is in perfect working condition. Good working condition. Only comes with 3 trays and not 6. Some marks on the magazine and scratches but it's in perfect working order. The Kenwood KDC-W3541A is also supplied with a front mounted aux input to hook up your portable mp3 player. Kenwood KDC-W3541A Features Front Aux input (Mini-jack)to connect portable audio players. Front AUX & USB Interface with slide protection cover. USB Features USB Mass Storage Class. CD Features CD Text Ready. Match your original unit with our pictures or numbers to ensure compatibility. KENWOOD KDC 258U CD RECEIVER 139X1313 IN GREAT USED CONDITION. Plays CDs, CD-Rs, and CD-RW discs including discs loaded with MP3 and WMA music files. CD player with built-in MOSFET amplifier (22 watts RMS/50 peak x 4 channels). Everything we do is centered on supporting you in fully realizing your potential.